Hashimoto’s Thyroiditis. Any medical term with the suffix “Itis” refers to an inflammatory condition or disease. In this case, it refers to inflammation of the thyroid gland caused by autoimmunity known as Hashimoto’s, hence the term Hashimoto’s thyroiditis. 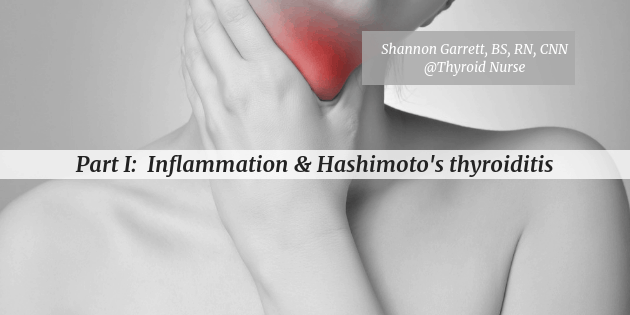 Think of chronic inflammation & Hashimoto’s thyroiditis as a fire burning out of control. Unlike the type of inflammation you notice when you experience a cut or bruise as the result of those wonderful fighter white blood cells congregating to clean up the area, chronic inflammation is not visible to the naked eye. 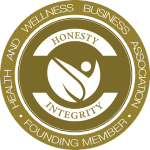 An imbalanced intestinal area also releases inflammatory chemicals into your body that can cross your brain’s protective barrier and take part in numerous mental health conditions like depression or anxiety. Furthermore, chronic inflammation is also what underlies most long-term and “mystery” health conditions including Hashimoto’s thyroiditis and other autoimmune illnesses, periodontitis, cancer, insulin resistance, and osteoarthritis. Preventative medicine ought to include information that, for example, periodontitis is rooted in inflammation and is an early red-flag and warning sign of a potential chronic health issue. 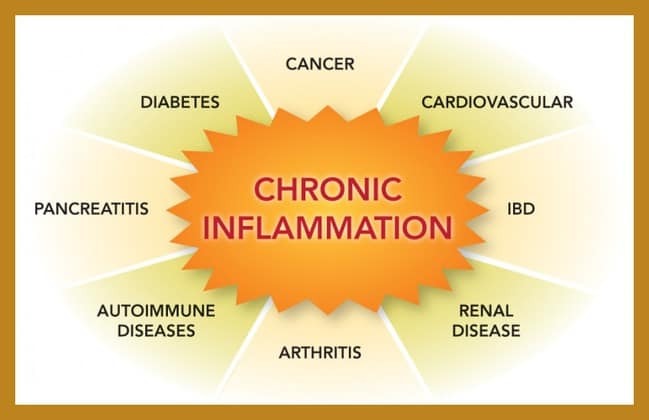 Inflammation is a silent killer because internal chronic inflammation is invisible and until you are affected with obvious physical symptoms, you may not be aware of the “fire” burning within your body. In addition to truly understanding the messages of your body to learn how to recognize signs of inflammation, it’s important to learn what symptoms may suggest chronic inflammation is becoming an issue. Were you inflamed even before you knew you had Hashimoto’s? Inflammation is a normal part of the immune system and acute inflammation definitely plays an important role. Acute inflammation is the first response to harmful stimuli. However, pillar #1 for Hashimoto’s refers to chronic inflammation…a process that continues long term leading to a shift in the type of cells involved. My first sign of chronic inflammation long ago was a puffy face, hands, and feet when I woke up in the morning whether I had eaten salt the night before or not. Puffy hands and feet are related to both inflammation and a reduction in antioxidants in the body. Aside from the puffy appearance, there’s also a sensation which may also feel like stiffness. It could also be that you haven’t hurt or injured your back but you have lower back pain, or you may have knee or shoulder pain. In these cases, you want to try getting hydrated and increase antioxidants which we will review in a follow-up article on inflammation. Inflammation is like a fire burning & antioxidants are the firemen to put out the blaze. The problem of chronic inflammation is magnified because the damaged intestinal wall makes it more difficult for you to absorb electrolyte minerals such as potassium, magnesium, and calcium. These minerals are calming and alkalizing and they help reduce inflammation. They’re also necessary to maintain proper pH balance; which by the way, an imbalanced pH in the body and inflammation go hand-in-hand. There’s a lot one can do to reduce and manage inflammation. After you’ve read all three articles in this series you should have a good understanding of the lifestyle/dietary changes you can make to successfully reduce inflammation. And, by implementing the tips and strategies I’m teaching, you’ll see an improvement in your symptoms related to chronic inflammation & Hashimoto’s thyroiditis. Reducing Inflammation begins with improving the health of the gut, immune system, and antioxidant levels. Vitamin D Most Hashimoto’s patients do very well with oral liquid vitamin D. I use the high potency formula by Designs for Health: Vitamin D3 Hi-Po emulsi. Each drop (not the dropper) is 2,000 IU’s. Omega 3 fatty acids at least 1500 mg three times per day – I use the following: Biotics Research Optimal EFAs and their Mixed EFAs. I also use evening primrose and flax oils. Topical transdermal glutathione cream – Apply 1 pump daily over the right upper abdomen (over the liver and/or thyroid gland) after a shower or bath. – Oral glutathione does not necessarily cross the cell wall, and blood glutathione levels don’t necessarily indicate glutathione levels inside the cell. – The best I have found is made by NeuroBiologix and it lasts a long time. You may also want to add my salad dressing recipes rich in healthy fats a few times each week. TAKE ACTION: Get your vitamin D checked if you haven’t done so in the past 60 days and work toward optimizing your level. Most functional & integrative practitioners like to see it somewhere between 70-90 in patients with autoimmune thyroid disease. My optimal level is 90’ish but you need to do what’s right for you. Next, you want to start to incorporate the shake a minimum of 3 days per week and follow the list to the extent you can. You may already be doing some or all of these things… to which I say congratulations – keep up the good work and you’ll reap the benefits. Blum, S. (2013). The immune system recovery plan. New York: Scribner. Brownstein, D. (2008). Overcoming thyroid disorders. West Bloomfield, Michigan: Medical Alternatives Press. Waldeck, D. (2013). Inflammation. The SGN Project, educational video series. I noticed chronic acne, especially when I was on my periods, and PMS, or at least bad menstrual cramps, around age 16, which was in 1971. I had had a bad sore throat in the summer at that age and was developing pain in the lower front part of my throat. Doctors were no help. I had a goiter by age 22, when I graduated from nursing school, so I had it checked out again. They said I had “hyperthyroidism” and I did have many symptoms of overactive thyroid. I went on PTU, then they did a subtotal thyroidectomy on me at age 24. They said they left a little bit of it on my left side “enough to keep you going.” Ha! It was not until age 60, which was 4 years ago, that I was diagnosed with Hashimoto’s thyroiditis and celiac disease, (by functional medicine practitioners) and narcolepsy. I retired as an RN 2 years ago. Last year I was also diagnosed with SIBO. I’ve been reading as much as I can and doing as much as I can, with more holistic treatments, to help me heal. I am slowly getting better, with the grace of God. Thanks so much for all you do! Thank you for sharing – you’ve been through a lot! Here’s a link to my Hashi’s Sister’s SIBO protocol – I hope you find it helpful! Thank you for sharing, and I hope the next two articles in the series will be helpful for you. If you like healing shakes, I have a new free guide coming out as well in the next few days. Thanks again for stopping by and leaving a comment. Take care of yourself! Thank you Shannon for this great series. Read celery juice is anti-inflammation and autoimmune and much more; is ok to have it in a smoothie too? When taking turmeric I do not feel any change.. but still good to take?